I have never been to Korea, but I have patronised quite a handful of Korean restaurants in Singapore to know how exquisite and delicious Korean cuisines are. And here at Vivocity, stands one of Korea’s leading BBQ Restaurants, led by celebrity chef – Jon Won Paik. I’m not here for any sizzling BBQ session, but for their Budae Jjigae / Army Stew ($40). I was really over the moon when they serve my favourite garlic sprout as one of the side dishes! The potato salad and seasoned anchovies were equally enjoyable. Beside Kimchi, I don’t really know how to appreciate other preserved food. The huge pot of Budae Jjigae is suitable for sharing among 2 to 3 people. Inside the pot of goodness, you will find sausages, spam slices, minced beef, bake beans, Shiitake mushrooms, Enoki mushroom, rice cake slices and Tang-Oh. Just add in a piece of ramen (included) and you get a pot of heavenly, fulfilling meal! We also ordered the Jap Chae ($23), Korean’s stir fried glass noodle. Sweet chewy noodle stir fried with vegetable and mixed with sesame seeds. I ended up consuming more of the simple Jap Chae than the Budae Jjigae ha-ha! At the end of the meal, we were served complimentary Omija Tea; traditional palates cleansing, sweet and sour drink which tasted a lot like plum juice, very refreshing. 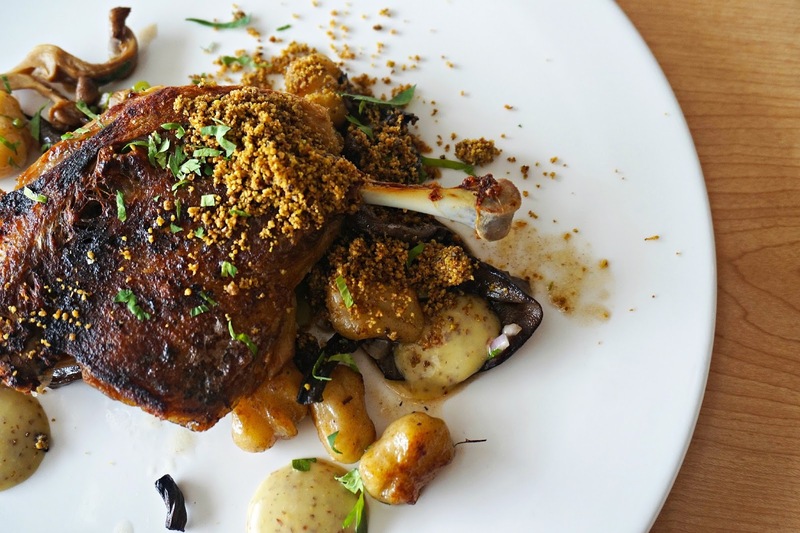 Apart from Saveur who offers affordable quality French cuisine, Concetto by Saveur is an extension set up by the Saveur group for consumers who are looking for exquisite Italian cuisines. Fortunately for me, on the day of my visit, I managed to score a seat before the crowd started coming in. I have a thing for bright, spacious dining places. Beside the ability to capture the beauty of the food, with natural lighting flowing in, it makes me feel less jammed up or suffocating. And here at Concetto, it is definitely bright enough with their full-length glass wall design. 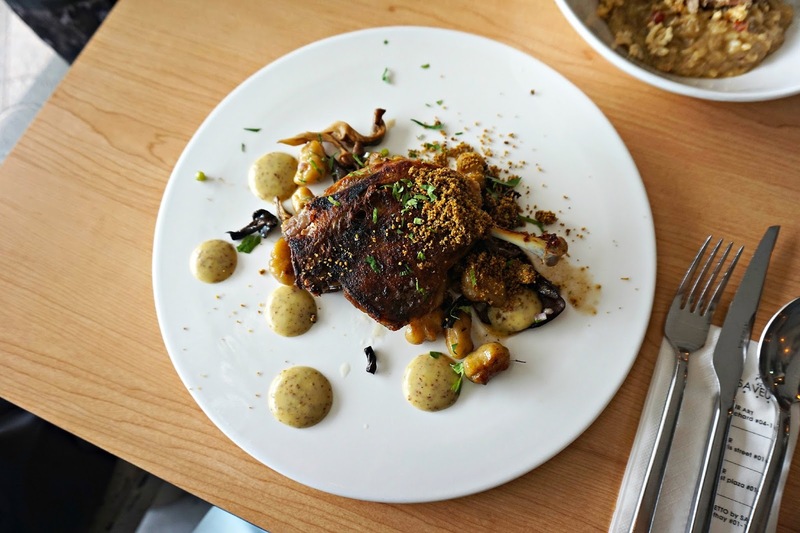 I was taken aback by the plating of the Duck Confit ($14.90) when served. Honestly, it felt more like an art piece rather than a dish to be consumed. Beautifully plated and structured, it could easily pass as a fine dining dish. As a person who is clumsy with fork and knife, it was a life-saving moment when the first knife down the dish shows how tender and easily separated the meat was. Through the pan searing technique, the skin of the meat was grilled to a perfect crisp. I don’t usually prefer starchy food, but here’s where the art of eating comes in; take a slice of the meat with the potato gnocchi, dip it in the honey mustard sauce, topped it up with those crunchy peanut-like bits and it was a mouthful of sweet chewy bites with tender smoked duck with a tint of crunch. I was so in love with the dish, I cleared the plate almost instantly. 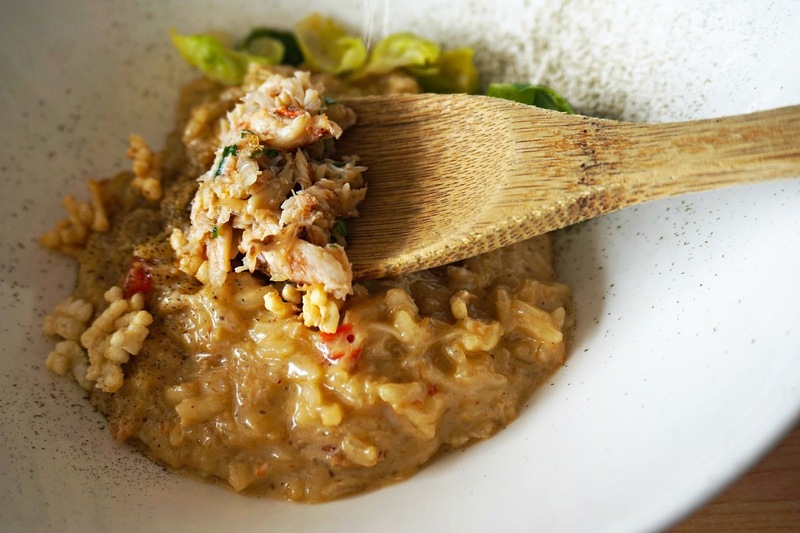 Unless you are a lady, this Crab Risotto ($14.90) might not be enough to fill your tummy. Similarly, the presentation of this dish is of quality standard, the food is tasty but predictable. Cooked in shellfish broth and crab meat, the rice undeniably tasted sweet and flavorful from the essences of the seafood but the entire combination could be better.